Two of the most popular martial arts originating in Japan are Aikido and Jujitsu. Both are close combat methods focused on the grappling category, and they mainly employ throwing and striking techniques. Aikido and Jujitsu share the same roots in terms of philosophy; in fact, the latter is an ancestor of the former. Their core essence is the ability to move from one technique to another to defend oneself. Their methods were developed around the principle of using an attacker’s energy against them, rather than directly opposing it. In spite of the notable similarity in philosophy, Aikido and Jujitsu are very different from one another. Dissimilarities include founding history, training style, techniques, level of lethality, and weapons. As mentioned, Jujitsu is older than Aikido – practically by centuries. Varying theories have their own accounts on the origins of Jujitsu, but most claim that it originated in the 17th Century in Japan. One theory states that it was founded by three ‘ronin’- Fukuno Hichiroemon, Miura Yojiemon, and Isogai Jirozaemon, with some mentoring from a Chinese man. Yet another theory claims that Jujitsu was created by a doctor named Akiyama Shirobei. Aikido, although younger, has a more precise historical account. It was founded and developed in the latter years of the 1920’s by Osensei, Morihei Ueshiba, who envisioned it as an expression of universal peace and reconciliation, more than a mere fusion of martial arts. In terms of training style, Jujitsu uses the principles of momentum based on the opponent’s force, balance, and leverage. Aikido, on the other hand, employs endurance, flexibility, and controlled relaxation. Pushing or extending movements are more frequently utilized than pulling or contracting movements. Both Jujitsu and Aikido place less emphasis on strength training, and are thus classified as ‘soft’ martial arts. However, they require both physical and mental competencies, similar to all other Japanese martial arts. Most Jujitsu schools put stress on methods that lock joints more than anything else. This is achieved by basically disrupting the opponent’s stability. When their balance is reduced significantly, they’ll be susceptible to being outdone by throws or takedowns. Sensibly, strikes are intended to target exposed and defenseless parts of the body. This serves as a crucial element in disrupting balance as a pre-requisite to more aggressive attacks such as throws and takedowns. By the same token, movements tend to capitalize on the attacker’s momentum and openings in order to place a joint in a compromised position or to break their balance in preparation for a takedown or throw. Furthermore, most Jujitsu throws go in a straight line. Generally, Jujitsu is more lethal than Aikido; it was used for combat centuries ago. In Aikido, basic moves for attack include both strikes and grabs, while throws and pins are intended for defense. Unlike in Jujitsu, throws in Aikido are based on circular movements. Some of the basics would be a series of throws, namely four-direction, entering, heaven-and-earth, figure-ten, and rotary throws; most of these highly rely on joint locks. Weaponry is one of the methods of combat in both Aikido and Jujitsu. Knives, weighted chains, helmet smashers, and disguised weapons are some of those used in Jujitsu. Short staff, wooden swords, and knives are used in Aikido. Jujitsu and Aikido are both martial arts that originated in Japan. Jujitsu dates back to the 17th century, while Aikido – the late 1920’s. Jujitsu’s main strengths are in momentum based on the opponent’s force, balance, and leverage. Aikido, on the other hand, emphasizes endurance, flexibility, and controlled relaxation. Jujitsu techniques are more deadly than those of Aikido. The former were, in fact, used in actual war. Both Aikido and Jujitsu used weapons as one of their combat methods. Jujitsu employed knives, weighted chains, and helmet smashers. Aikido used short staff, wooden swords, and knives. Celine. "Difference Between Jujitsu and Aikido." DifferenceBetween.net. June 22, 2017 < http://www.differencebetween.net/miscellaneous/difference-between-jujitsu-and-aikido-2/ >. The term ‘aiki’ was in use approximately 900 years ago. aiki principles have existed since time immemorial. Your article does not even mention the internal part of aikido (terming both jujitsu and aikido as soft arts). Jujitsu are general techniques used to screw up your opponent. 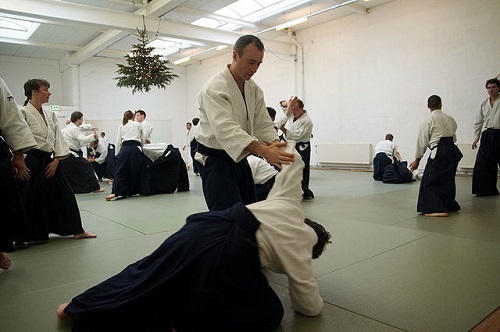 AikiDO is a means of self cultivation and the study of aiki ie training to obtain an aikibody then using techniques to train on a movement of that aikibody. O’sensei always said there are No techniques in aikido, unlike the modern kata-based abomination created by his son, Kisshomaru.